Blend yogurt with sea-salt and place into strainer. 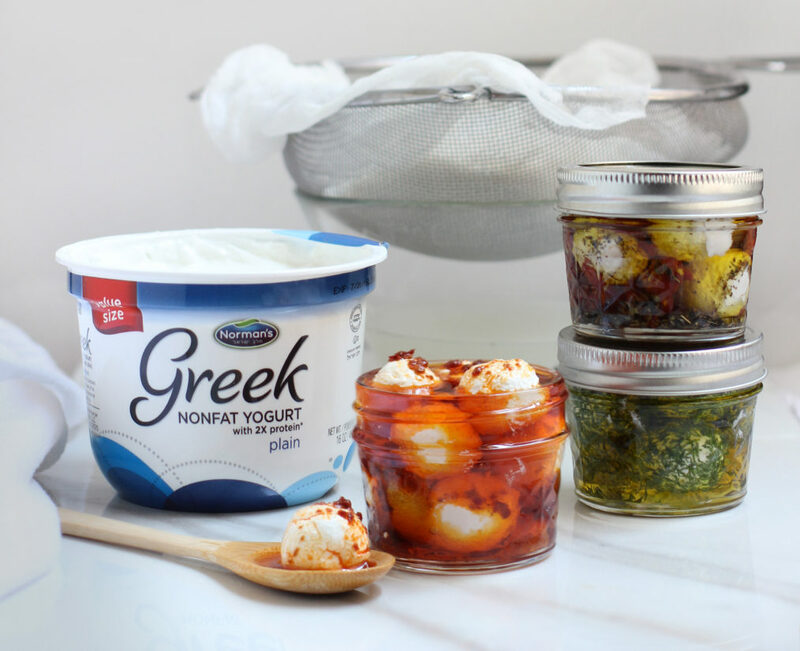 Wrap the cheesecloth over the yogurt, cover and refrigerate. After 24 hours, change the cheesecloth. Refrigerate for another 24 hours. Separate the cheese into three equal parts. With slightly damp hands, roll the cheese into balls. Fill one mason jar with harissa and lemon zest, top with balls of cheese. Pour olive oil over the mixture and cover. In a second jar, place sundried tomatoes, basil, and oregano; fill with balls of cheese. Pour olive oil over the mixture and cover. Roll remaining cheese balls in fresh dill and chives, place in third jar. Pour olive oil over cheese and cover. Marinate for at least 8 hours or up to 1 week in the refrigerator. Add labneh balls to a cheese platter, serve with fresh Challah or alongside olives and crudites.